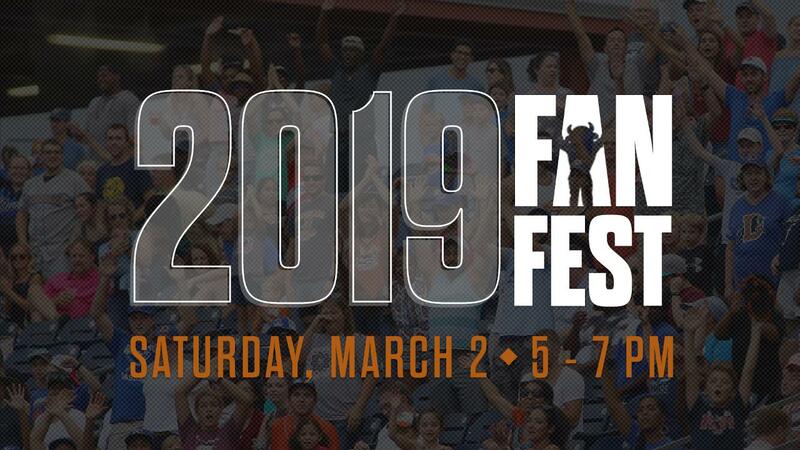 The Durham Bulls will host their 2019 Fan Fest on Saturday, March 2 from 5 p.m. to 7 p.m. at Durham Bulls Athletic Park. The free event provides fans a chance to take batting practice on the field, purchase single-game tickets for the 2019 season and take photos with the Governors' Cup trophy. Additionally, National Anthem auditions will take place prior to Fan Fest from 3 p.m. to 4 p.m. If you or a member of your party is planning on going on the field, please complete this waiver and print it out prior to your arrival to shorten your wait time. The event will feature a free raffle for all fans in attendance, with a grand prize consisting of a free night in the Bulls Team Suite at Durham Bulls Athletic Park for the winner and a group of 20 friends. Following the game the group will partake in a private batting practice event on the field of the DBAP. Each fan in attendance will be given a raffle ticket upon arrival, and fans can earn more tickets throughout the event in a number of different ways, such as purchasing individual game tickets and packages, retail purchases and signing up for various promotions. In an effort to increase fan safety, two batting practices will be held at the event. All attendees 13 and older wishing to hit on the field will be able to do so from 5 p.m. to 6 p.m., and all fans 12 and under wishing to take batting practice may do so from 6 p.m. to 7 p.m. Fans will not be allowed in the outfield until 6 p.m., at which point catch on the field will begin. The team's ticket representatives will be available to showcase available 919 Club member seating locations, and the Ticket Office will be open as well to provide fans an opportunity to purchase tickets to games such as Opening Night, Star Wars Night, Lollygagger Night and more. Fans who purchase 919 Club memberships at the event will have the opportunity to set off the 'Home Run Whistle' along with the famed 'Hit Bull Win Steak' sign. 919 Club members in attendance will be able to pick up their membership packages in the PNC Triangle Club. In addition to 919 Club packages and single-game tickets, a special Fan Fest Pack will be available only on March 2. The three-game ticket deal offers fans tickets to Opening Night, Father's Day and Labor Day for a total of $33. Fans eager to secure single-game tickets for the 2019 season can do so from Monday, Feb. 25 through Friday, March 1 in an online-only sale, and tickets will become available by phone and in-person at the DBAP beginning March 2. National Anthem auditions will also take place at the DBAP the afternoon of March 2 from 3 p.m. to 4 p.m. for people wishing to perform the Star Spangled Banner at a Bulls game in 2019. Performers who arrive after 4 p.m. will not be permitted to audition. Performers will have one minute and 30 seconds to perform the anthem, and lyrics must be memorized and performed in a traditional style. Participants for anthem auditions may enter through the ballpark's left field gate and register upon arrival to perform on a first-come, first-sing basis. Singers may leave at the completion of their audition and will be contacted at a later date as the Bulls choose who will perform at limited, select dates during the 2019 season.